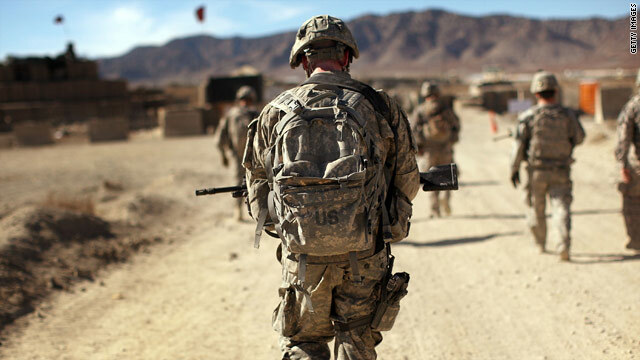 Officials warn that with wars ongoing in Iraq and Afghanistan, above, changes to military policy will not come quickly. Washington (CNN) -- In an effort to repeal the military's policy of "Don't Ask, Don't Tell," some members of Congress are looking at putting a provision into the defense authorization bill coming up for a vote. Passed by Congress in 1993, the law allows for the discharge of gay, lesbian and bisexual members of the military if they announce their orientation, engage in sexual relations and are caught, or attempt to marry a person of the same gender. Since its enactment, more than 13,500 service members have been discharged, at a cost of more than $400 million, said the office of Rep. Jim Moran, D-Virginia, in a statement. Part of the reason for including it in the spending bill is that supporters don't have enough votes to pass a separate measure repealing Don't Ask, Don't Tell: the Military Readiness Enhancement Act of 2009. An aide to a leading sponsor of the bill admits that the Don't Ask, Don't Tell legislation did not secure the support of the 218 members needed to approve it on its own. Republican Rep. Ileana Ros-Lehtinen of Florida is the only member of her party to join 186 Democrats in signing on to the readiness act. The reality caused supporters to rethink their strategy, and they are now likely to attach the measure to the spending bill, the aide said. A group of Democrats is demanding that the Pentagon give up-to-date information on the Don't Ask, Don't Tell policy. In late December, Moran issued a letter to Secretary of Defense Robert Gates, signed by 96 members of Congress, requesting monthly reports detailing the rank, time in service and branch of U.S. service members discharged under the military's policy in 2009. Moran's letter requests that Gates' office provide all Don't Ask, Don't Tell data from January 1, 2009, until the present by Friday. A spokeswoman for Moran said Friday night that the Pentagon had not responded either way to the request. The last report to Moran came after a request to the Army for data on the number of service members discharged in January 2009. Moran said that if the Pentagon doesn't provide the information by Friday, his group will be forced to take legislative action in receiving the monthly reports. In addition, Moran's letter asks the Department of Defense to provide a report on Don't Ask, Don't Tell-related discharges occurring across all branches of the military on a monthly basis in 2010 and beyond. The information would include the discharged service member's job specialty, time in service and branch served, according to Moran's office. The nonpartisan Urban Institute estimated in a 2004 report that there were nearly 65,000 gays and lesbians in the military, about 2.8 percent of those serving. The organization based its findings on the 2000 Census. Moran and other members of Congress -- including freshman Rep. Patrick Murphy, D-Pennsylvania, an Iraq war veteran -- have encouraged the Obama administration to make a priority of repealing the policy. On the Senate side, Democrats Carl Levin of Michigan and Kirsten Gillibrand of New York have spearheaded the effort. Levin said Wednesday that the Senate would hold a Don't Ask, Don't Tell hearing at the end of January with Gates and the chairman of the Joint Chiefs of Staff, Adm. Mike Mullen. Gillibrand said in July that the policy is an unfair and outdated practice that "violates the civil rights of some of our bravest, most heroic men and women." The issue has been a lightning rod for gay groups pressing the Obama administration to get legislation to Congress for a vote -- or simply suspend the program all together. During the 2008 presidential campaign, candidate Barack Obama promised to end the policy. Obama as president has been criticized by gay, lesbian and bisexual groups such as Servicemembers Legal Defense Network for not pushing harder to get it repealed. And it's not just gay groups urging a change in policy; in 2008, more than 100 retired generals and admirals called for a repeal. Former Secretary of State Colin Powell has called for a review of the policy. Mullen, the military's top uniformed officer, said in July that he was beginning to work with his staff on how a repeal would be implemented. But, he advised, with two wars ongoing, the decision will not be hurried. Gates has also indicated that he is examining ways to make the policy more humane. The defense secretary would "like to change that policy, but there's legislation that impinges on that right now," a Pentagon spokesman said in July, referring to the current law. But there is also opposition to the repeal. In the spring, more than 1,000 retired officers signed a letter organized by Flag and General Officers for the Military, urging Obama to uphold the law. "We believe that imposing this burden on our men and women in uniform would undermine recruiting and retention, impact leadership at all levels, have adverse effects on the willingness of parents who lend their sons and daughters to military service, and eventually break the all-volunteer force," the letter stated.